The latest gadget for Doctors. New style statement. In your commitment to patient care. Own the gadget with sound quality that you expect only in High-end stethoscope. High quality. High clarity sound. Spend less, get more. Connect to the speakers let the patient/students listen to the defective sound, convince them about the effectiveness of your treatment. Record & transmit the sounds for a second opinion of save it for research/future reference. A boon to telemedicine. Visualise the sound in waveform & explore new dimension in diagnosis. Edit, amplify, filter. Listen to the sounds you really wanted to listen, control the volume. Minimise lung sounds when you want to listen to heart sounds or other intra body sounds or vice-versa. Top Panel Operations Filter High/Low. 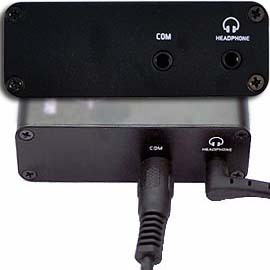 Specifically amplifies the sound range (20-1000 Hz) for heart sounds & (70-2000 Hz) for lung sounds. 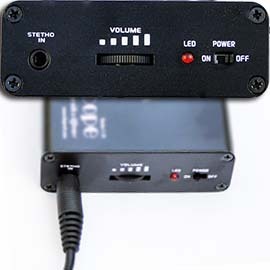 Front panel Switch On/Off Processing unit, Plug-in Stetho input, and Volume control with specific sound amplification Technology, DigiScope can Amplify Sound up to 200 Times. 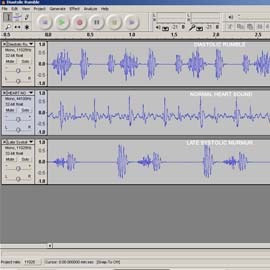 Display and Sound recorder software can record Heart, Lung and abdominal and can also be seen on computer & Recorded for Analysing, reviewing, transmitting through Internet for second opinion. Using DigiScope is very easy. The design is intutive. Small R and D here n there will make you perfect in extrating the best out of it. It is simple Plug n play. 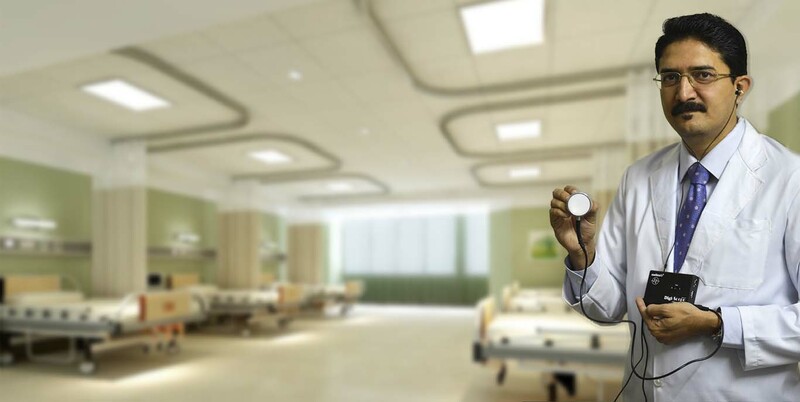 Nambison’s Digital Stethoscope is a state-of-the art intrabody sound Auscultation System (with specific sound amplification Technology) hardware coupled with software. 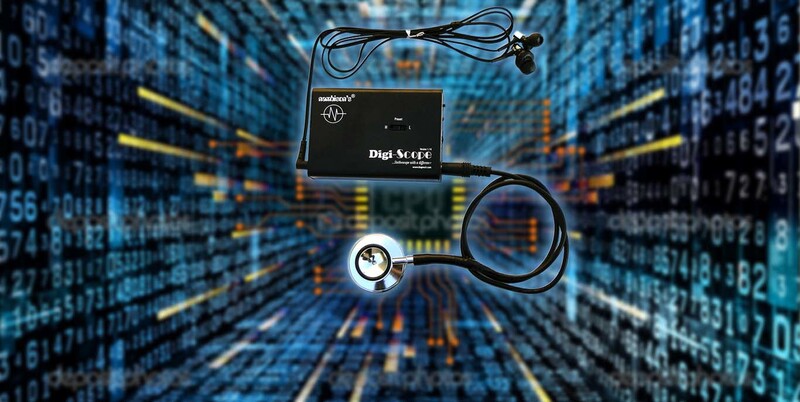 With Breakthrough indigenous Technology, DigiScope can Amplify the body sound up to 200 times. With 200X Amplification, it enables doctors to catch the sound that is usually hidden from the conventional stethoscope. This Intra-Body Sound can be recorded on the computer for Analyzing, reviewing and transmitting it through Internet for second opinion or can be analyzed on follow up. What to expect in the DigiScope HD box? Please go through the video to see how it works. Note: Only for illustration, the accessories may vary. Continuous patient monitoring in IPD or treadmill. Transmit Heart-lung-abdominal sounds from remote village to expert for critical decision & intervention. Very useful in childhood pneumonia. A boon for medical teaching, simply plug DigiScope to speaker & let the students learn to diagnose the pathological sounds. Let the patient & his attendants listen to the pathology going on in his body, this will long way in building confidence in your treatment. A natural difficulty Paediatrician faces is the baby starts crying while looking at the doctor, this obscures many sounds. If the long piece of wire with stetho chest piece is handed to the mother she can place it on the kid, which would make the job easy. While the patient is anaesthetised let all the people in Operation theater continuously listen to patients heart sounds, if it sinks or becomes feeble immediate action can be taken. share with us, we shall tell the world, let us explore more applications of digital diagnosis. Internet Banking: The said amount can also be directly transferred to the account of "Nambisons SoftroniX" with the below mentioned details. State Bank of India A/C No. : 34853386343; Account Name : "Nambisons SoftroniX"
Nambisons SoftroniX continously strives hard to bring innovative software and hardware to the profession for improved patient care, with improved outcomes. The earlier version of DigiScope was welcomed by the profession so much so that demand outnumbered supply, and we could not supply to many eager customers, we feel sorry for that. 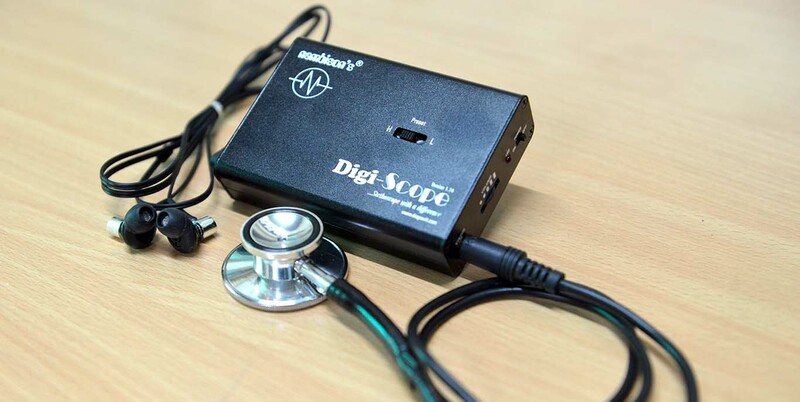 After a long waiting period DigiScope is back with improved version V 1.14 if you have made up your mind to buy Digital Stethoscope don't waitHURRY UP BEFORE STOCK ENDS. We have outsourced manufacturing for concentrating on research rather than manufacturing, we worked hard on improving the quality of the product. 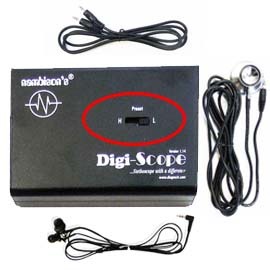 And now we are proud to present to the profession an indigenous Indian digital Stethoscope DigiScope. DigiScope owes its present day shape due to Mr.Dilip Khushlani, Ms.Bu, and Mr.Nemesh Singh CEO Appointy Inc and our team behind the curtain. "This will revolutionise the way telemedicine, diagnosis, and medical teaching happens today" (Dr.Nambison).